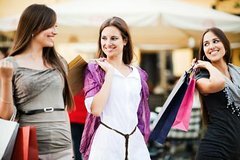 Shop 240 exclusive designer brands at one of Miami-Dade County's largest and most exciting shopping centers on this Dolphin Mall shopping tour! Visit the best of the Dolphin Mall’s value-oriented stores on this worry-free day trip via comfortable, air-conditioned coach. Browse through discount racks at the Sony Outlet, Coach Factory Store, Nike Factory Store and more. Once you’ve shopped up an appetite, stop by one of the various restaurants. And don't worry about purchasing too much -- there will be plenty of storage space in the coach for your shopping bags! Browse through the Dolphin Mall’s most exclusive outlet shops on this shopping day tour from Miami! Enjoy the short drive in a comfortable, air-conditioned coach that allows you to maximize your shopping time without worrying about renting a car, paying for gas or parking. Visit your favorite discount and designer stores like Sony, Coach, Nike, Gap, Swarovski and more! The Dolphin Mall is designed to reflect the fashion capital of Florida – Miami! The 240 value-oriented stores are split into three districts: Ramblas (meaning ‘walk’), which boasts exquisite restaurants and entertainment venues; Playa (meaning ‘beach’), offering casual apparel, accessories and charming home décor; and Moda (meaning ‘style’), which showcases exclusive boutiques and trendy outlets. Browse the designer brands and enjoy the discount prices at the outlet and factory stores. After your shopping fix, choose from dozens of restaurants to satisfy your appetite. Or celebrate your savings with a cocktail – no need to worry about driving back to Miami!